The Megamo is one of my first XXL designs made for a larger open space. It now comes in two sizes, still both are very large. The Megamo has been made for many businesses; hospitals, furniture stores, city halls, corporate headquarters, wineries, law offices, galleries and universities. 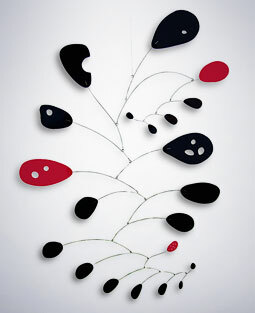 All needing a large Calder-kinetic style art mobile to hang in their open area. This large mobile is actually very light in weight, comes all assembled, and ready to hang. For lot's of photos, see my clients' photo page.